It added that any charges to parents on the scheme must be voluntary. 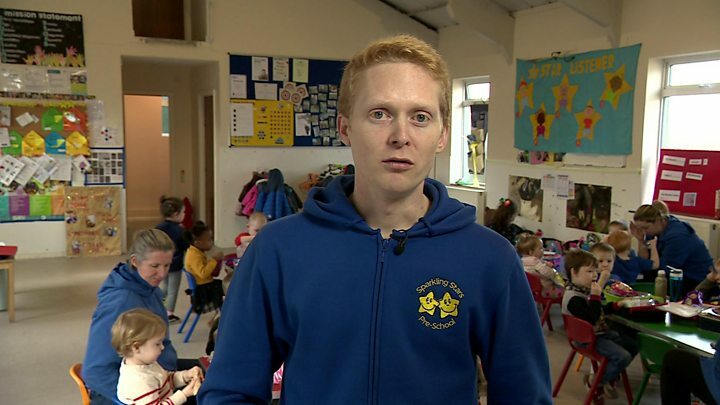 The poll of nurseries, pre-schools and childminders is the first to be carried out since the 30-hour free childcare scheme came into effect in September, and has been shared exclusively with the BBC. Families where both parents are working more than 16 hours a week, but earning under £100,000 each, qualify for the scheme. It expands the number of free hours childcare for this age group from 15 a week. But nurseries and pre-schools have long warned they will struggle to make ends meet because the hourly rates they are receiving from the government are too low. Nurseries and pre-schools have already been cross-subsidising the previous entitlement of 15 hours a week with fees from non-government funded children. According to the survey, conducted online among alliance members, over a third said they were making up losses by upping fees for younger children. And charges for items such as meals and nappies are also being made at a third of the settings that responded. Most said the hourly rates they were receiving from the government were below what they charged parents not on the scheme and failed to cover their costs. And a fifth thought they may not be financially sustainable by next year. Some already have closed their doors. And numerous local authorities are no longer promoting the scheme as "free", instead referring to the hours as "funded" in their advertising instead. One nursery told the alliance: "Funding rate not increased for the seventh year, coupled with cost of increased pension contributions and increase in living wage and minimum wage, we are seriously concerned about our future survival." More than three-quarters (some 77%) said if the funding stayed the same next year, it would have a negative impact on the business - 44% described that negative impact as "significant". Another provider said: "It does not currently seem financially sustainable. If the funding rate does not increase, the only way we can still offer the places is by charging for extras, [in other words] charging for the gap in underfunding." Chief executive of the Pre-School Learning Alliance Neil Leitch said: "It's clear from these findings that the government's flagship childcare policy is failing both providers and parents. "Respondents have laid out in black and white that the 30 hours policy is simply not working, with a continued lack of adequate funding leaving many with no option but to pass the funding shortfall on to parents. "This has left parents to pay the price for government underfunding through often unexpected charges for things like nappies, food and trips, while the government continues to claim that it's delivering on its promise of 'free' childcare." He said that since the policy had been announced, the childcare sector had repeatedly said the scheme would not be sustainable in the long term. "Thousands of parents and providers have now joined our Fair Future Funding campaign to demonstrate their concerns. "The government should not have needed more evidence of a childcare funding crisis - but here it is." He added that if ministers did not want to leave parents picking up the tab, or more nursery closures, they needed to increase funding urgently. The National Day Nurseries Association chief executive Purnima Tanuku said: "These are extremely worrying findings and sadly echo our own research over the last year. "The government needs to be honest with providers and parents that 30 hours funded childcare is not 'free'. "There is a significant shortfall between government funding rates and the cost to nurseries of providing childcare." For example, in Suffolk the funding rate is £3.87 per child, per hour, compared to the £5.20 per child, per hour it costs to deliver a place. A Department for Education spokesperson said: "We are investing a record amount of around £6 billion every year by 2020 in childcare and have doubled the free childcare available to working parents to 30 hours a week, saving them up to £5,000 a year per child. "Providers can choose whether to offer 30 hours and what pattern of days and hours they offer parents. We have always been clear that government funding is not intended to cover the costs of meals or additional services. "However, while providers can charge parents for additional extras, this cannot be a condition of the child's place."